As your business grows and technology becomes a more integral part of our lives, the role of social media becomes even more important to future success. But the thought of having to run your business and learn the best ways to put social media to use can be overwhelming. That’s where a social media manager comes in. An effective social media manager already knows the best practices for a wide range of platforms like Facebook, Twitter, Instagram, and the rest. 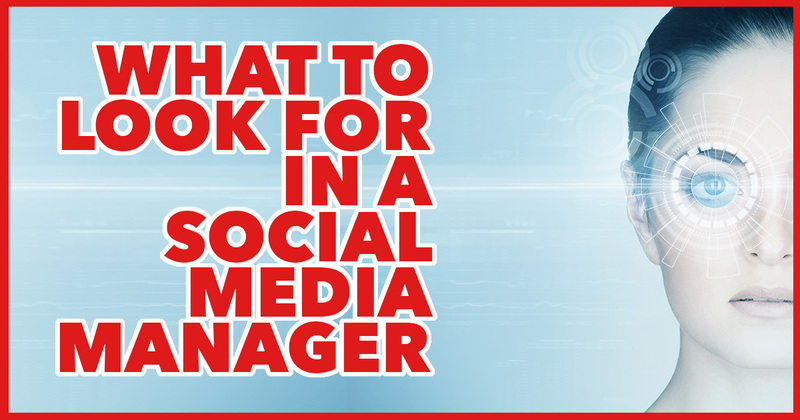 But what else should you look for when bringing a social media manager onto your team? Like any position at a business you’ll want someone with a background that is strong in the areas that help a social media manager flourish. Writing skills are a must since most platforms require clever written information. Understanding basic photography or having graphic design skills means a social media manager can create good-looking content. Social media platforms are better, faster, more efficient marketing tools so a background and understanding of marketing principles will help your social media manager succeed. There is cocky, and there is confidence. A knowledgeable person will be confident in developing their strategies for different social media platforms. A cocky person will simply boast about lofty numbers. Each social media platform requires a different touch in order to optimize their use. A smart social media manager understands how hashtags, for instance, are used on Twitter as opposed to Instagram or Pinterest. A confident social media manager will provide a very clear voice for your business to project to the world. Social Media managers don’t have to know every particular about your business when they come in. But they should be curious about learning as much as possible. While it might seem preferable, for example, if you own a bait and tackle shop, to hire a manager who is also an avid fishing enthusiast too much familiarity can hinder the process by not allowing the social media manager to speak to a broader audience. Whether you bring aboard a manager with intimate experience or not, curiosity should be an important part of a manager’s personality. Learning about your business and how to best target customers is part of what should motivate a manager to work hard for your business. A social media manager on your team should be able to speak for your business in ways that make smart use of each social media platform. Even if you can’t visualize your nail salon on Instagram, a social media manager will see the potential in vibrant photos to show off your work. If your photography business has great visuals but is lacking in juicy content, the social media manager will create the content to attract more people to your pictures. A great business will speak volumes to those who see what you have to offer. An effective social media manager projects that voice to a global audience. Even with all the skills in the world, a social media manager who does not understand connectivity will not send your social media presence soaring. Connectivity comes from a strong and active sense of communication. The right manager will listen to what you want for your business and translate that into what customers on Twitter, Facebook, Instagram, and the like want to hear. The right manager will project these ideas in ways that will reach out to an audience far beyond what any billboard or even a tv commercial could reach. At Pace Setting Media we work hard to meet all these criteria and more. We will listen carefully to both our clients and to what their customers are saying and create a social media strategy that is right for you. Our goal is not just to reach more potential customers for you but also to increase the brand loyalty of your current customer base. Your success is and always will be, our success.